Mix all the ingredients and make powder but not so fine.It taste better if is coarsely grounded. 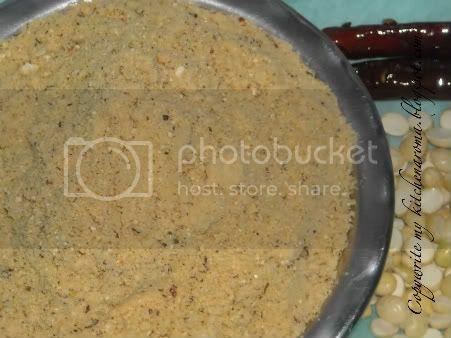 It usually eaten with dosa or sprinkled on the dosa and known as podi dosa.I love to eat this with hot rice and a dash of ghee. This is the easiest powder to make,no frying nothing.Just gather all the ingredients and make powder out of it.This is my mom's recipe. ya, varunavi, this is so simple to make with few ingredients. This is a no fuss podi ;) thanks for sharing the recipe dear. Hey thts something new to me...can u tell me how u use it? Powder! It's tingling my senses here! Even makes me drool! Yes simple but very tastey love to have with hot rice and a few drops of gheeyummmmmmmmmm. Simple and favourful dal powder, looks yum! Very simple one but delicious and healthy one.